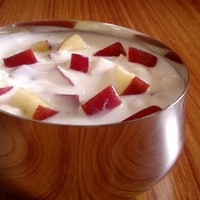 A slightly tart and sweet apple yogurt. You can compare this flavor to one of those commercial sweet yogurts. Im sorry for all you sucralose haters out their, its kinda needed for this recipe to be accurate otherwise you end up with a ejuice that is to sour/tart. This recipe is the property of Fuzzy055 and released under the CC Attribution-NonCommercial-Sharealike 4.0 license. You may not copy, derive or commercialize this recipe without following the terms of this license or the explicit permission of the creator. Simple and to the point. Nice mix of the sweet, acidity and yogurt. Although I personally have toned down the sweetener a bit. This is perfect. I was expecting a little more sour from the yogurt, but what I got was like biting into a fuji apple...except instead of a juicy, acidic bite I got a sweet, smooth cream. This is definitely going into my list of bangers.